Sri Lankan pygmy blue whales: How to prevent ship strike deaths of endangered species. How to prevent ships from killing endangered pygmy blue whales. A blue whale in the Indian Ocean, Sri Lanka. Sri Lankan blue whales live in busy shipping waters. Asha de Vos, a marine biologist at the University of California, Santa Cruz, and founder of the Sri Lankan Blue Whale Project, is using mathematical models to put them out of harm’s way. You advocate using mathematical models to prevent Sri Lankan whales being killed by ship strikes. How big a problem is this? Ship strikes are a well-known cause of mortality for all types of whales everywhere. But Sri Lanka is in the top 0.2 percent for global shipping traffic. In 2012, a blue whale was found wrapped around the bow of a container ship that came into Colombo, Sri Lanka’s main international port. Days later we found another carcass floating at sea with gashes from a ship. But for every whale that is found, at least 10 go unseen because the carcasses sink or get pushed out to sea. Collecting evidence of this problem is pretty challenging. What’s special about Sri Lankan blue whales? They are a unique subspecies of pygmy blue whale. At 25 meters long, they’re about 5 meters shorter than the Antarctic blue whale. Also, unlike other blue whales, they don’t migrate to the poles to feed but stay largely in the northern Indian Ocean. They also speak a very different dialect. 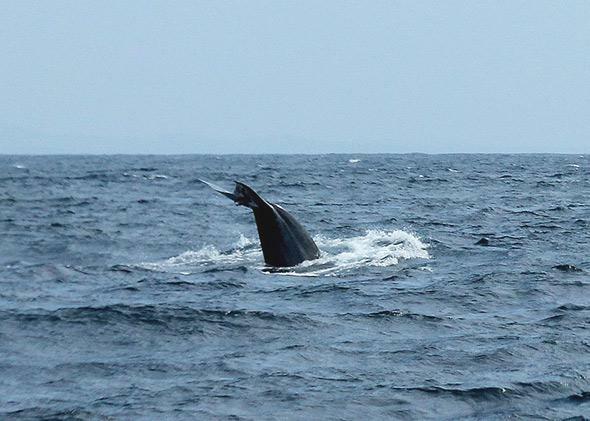 These whales rely on the area around Sri Lanka for breeding, calving, and feeding. I am interested in finding out why, what sustains them, and how important the area is to their survival. How many of these whales are there? We don’t have an estimate yet, but my team is putting together a photo-identification catalog that will help us determine this. We know they are endangered. Nearly 1,300 were killed by illegal Russian whaling in the 1960s and ’70s, but today the biggest threat is ship traffic, which is projected to double globally in the next 20 years. What safety solutions are there? Voluntary boat-speed reductions, giving whales more time to get out of the way, have been used to protect right whales along the southeastern U.S. coast. Another solution, used off the coast of California, is to redraw the shipping lanes to areas less heavily visited by whales. In collaboration with scientists involved in those efforts, I’m working on mathematical models to understand which areas are key to the survival of the Sri Lankan whales, and where they intersect with shipping lanes. How will models help prevent ship strikes? Using sighting locations and satellite data on temperature, chlorophyll concentrations, and salinity, we build habitat models. When we know which conditions attract whales, we can identify other areas in which they might gather, then overlay the shipping lanes to see where the ships and the whales come together. Then we can target those areas for reducing the likelihood of collisions. What’s the next step in protecting the blue whales in Sri Lanka? First we need economic studies: If shipping lanes need to be shifted, what is the most feasible way to do it? We also need to understand the risk of extinction. Once we have this information, we can work on solutions with maritime authorities. But we also need to inform people that this problem exists and drive home just how important these species are for the broader health of the planet.